The Vendo 480 was originally made to vend bottles and cans but bottles are a little problematic. This is a great high capacity can vendor and works flawlessly with 12oz cans. Small to medium locations. Vendo 480 Drink Machine The Vendo 480 drink machine was originally built to vend both bottles and cans. But with time, vending bottles have not done well. Too many jams .After years of being in this business we know what to replace on a machine and what to keep. Remember we have been in Vending since 1964 and have remanufactured machines for some of the larger bottlers such as Pepsi, Gatorade, Nestles Waters, and Nestle Quick. We know what parts need to be replaced in each machine. Quality is what we look for every day. The Vendo 480 vends 12oz cans flawlessly. This is a great high capacity can vendor. 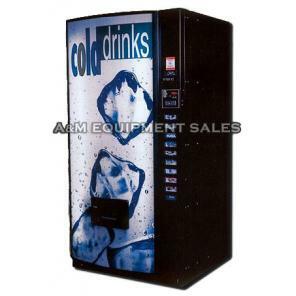 The Vendo 480 drink machine is great for small to medium sized locations. Usually for small to medium size locations. Dimensions: 39″ W x 31″ D x 72″H. 8 Selections of canned drinks. Some people claim this machine will vend bottles but watch out. Stay with 12oz cans. Optional credit card reader available $299.00. Two Different Credit card readers can be purchased for $299.00 each Nayax and USA technologies. Optional MEI Conlux changer and bill Validator can be installed for an additional $309.00 for the pair. New MEI Conlux comes with a two year warranty excluding freight. New lexan waterfall sign, paint, new lock and keys, your choice of flavor strips. We set prices and make sure every part of the outside of the machine has a new looking appearance.